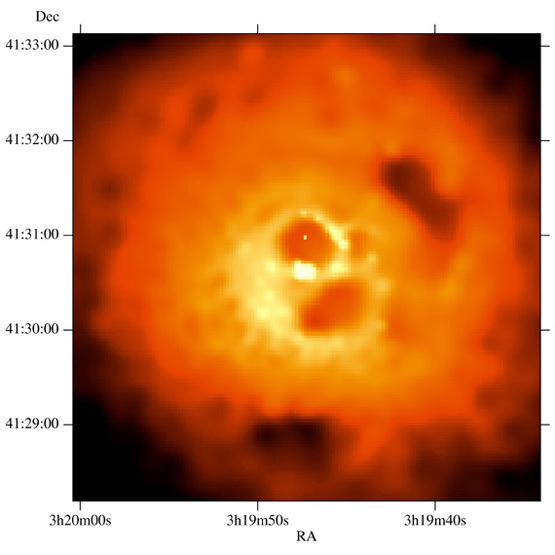 Core of the Perseus Galaxy Cluster in X rays. Chandra's X-ray image of the core of the Perseus galaxy cluster shows hot gas in and around the supergiant galaxy, Perseus A. The colors represent low (0.5 - 1 keV = red); medium (1-2 keV = green); and high (2-7 keV = blue) X-ray energies, corresponding to low, medium and high temperatures. The small dark patch (located at two o'clock from the center of the image) is due to the absorption of X rays by gas in a galaxy of about 20 billion stars that is falling into the central galaxy. 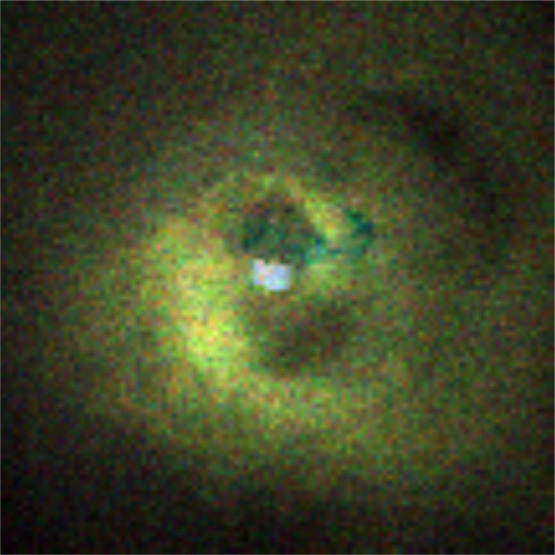 The bright blue spot in the center is due to X-radiation from gas around a giant black hole in the nucleus of the galaxy. The twin dark cavities-- each large enough to contain a galaxy half the diameter of our Milky Way galaxy­ are thought to be buoyant magnetized bubbles of energetic particles produced by energy released from the vicinity of the black hole. As 70 million degree Celsius gas from the surrounding cluster settles onto Perseus A, it "cools" to a temperature of 30 million degrees C and piles up to form the bright rims around the dark cavities. Coordinates (J2000) RA 03h 19m 48.10s | Dec +41° 30' 42"